Theatrical animation lead by Lucía Sanchez and Quique Mongay, actors. Family activity, free entry. Limited spaces. The closing event of the program “Família! El dissabte va d’art” (Families! Saturday is about art) will take place on 19 May 2018, at 11:00. It is linked to the activities of International Museum Day 2018. The sea, travel, desire, the future, photography… have been some of the main points of the different family workshops this season. 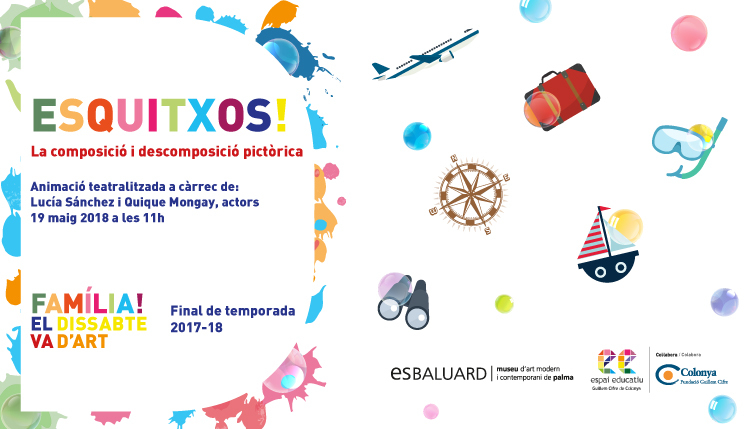 We will revisit all of them accompanied by Lucía Sánchez and Quique Mongay with “Esquitxos! pictorial composition and decomposition”, a theatrical animation proposal. It will refer to the good times lived this year at the family workshops. We will encourage you to remember, observe and enjoy but also to act and participate! The activity is free, targeted at families, especially the families that have taken part in the season´s workshops, and also open to anyone who would like to join us in a different morning in the Museum.